-50 copies as subscribers edition including yellow vinyl, bonus CD and a badge. 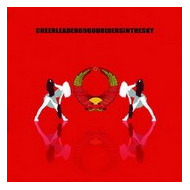 This Cheerleader 69 album, a side-project from vx69, the frontman & singer of the french industrial techno punk machine Punish Yourself, is finally available, digging its inspiration both in the rythms of Test Dept, the ambiances of Coil in their Horse Rotorvator era, and the symphonic lyricism proper to the martial/neoclassing scene. vx69 proposes an excellent record, very personnal & iconoclastic.